Soul Fodder: Travel Rules - Does foreign etiquette apply to visitors? Travel Rules - Does foreign etiquette apply to visitors? Several years ago, Diesel and I spent two weeks in Rome. Even though it was October, it was surprisingly sultry. Anyone that knows Diesel knows that the man runs hot. Not just that, but he literally radiates heat when he gets too toasty. As a result, he rarely wears more than a t-shirt and shorts unless he has to. And for our visit to Vatican City and St. Pauls Basilica, I insisted that he wear pants. After all, the Vatican has a strict dress code that specifies no skirts above the knee, no bare shoulders, no shorts and no bare feet. The last thing I wanted to do after waiting in the massively long line was to return to our rented apartment for him to change. Grudgingly, and with no small amount of grumbling, he acquiesced and we headed off to Vatican City. And that was where I got into trouble. 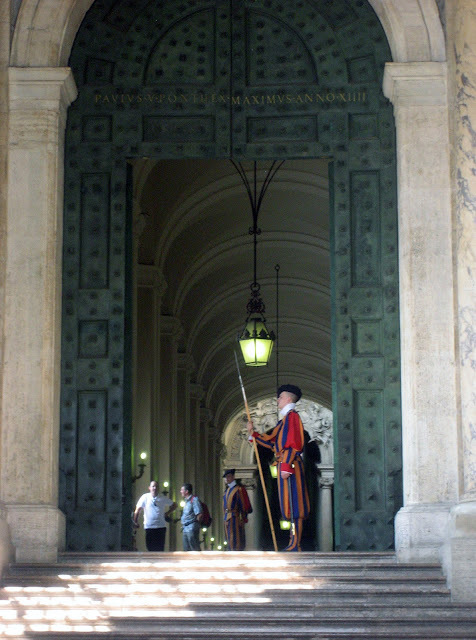 A Swiss Guard in Vatican City. Not for my outfit, or Diesel’s even, but for everyone else’s. Because a large number of visitors to the Vatican that day were wearing shorts, and Diesel was pissed. Because he always runs so hot, Diesel is never in a particularly good mood when he is extra hot, and since I was the one who inflicted the extra warmth on him, he was not a fan of mine that day. But how was I to know that the dress code wouldn’t be enforced? I have always been one to follow the rules and as visitors I felt that we should comply with the wishes of our destination. Other than Diesel’s occasionally snide remarks about how I forced him to wear pants against his will (is it me, or does that sound just a little bit naughty?) this incident had mostly been relegated to the annals of history until I spent the weekend in Istanbul. I knew before the trip that I would need to cover my head when I visited the mosques. I even brought two scarfs in different styles with me (have I mentioned I compulsively follow the rules?) just to cover my bases. Men praying at the Blue Mosque in Istanbul. And yet when I was in the mosques, at least half of the women inside had bare heads. I seemed to be one of the few people who were concerned about respecting the cultural standards in Turkey. And not one word was said to those who were flaunting the rules. I feel that observing the cultural expectations of my destinations helps me to understand them better and gives me a more authentic view of what they are truly like for the locals. I think that disregarding the cultural norms of a place is a little like cheating on a significant other - just because you can get away with it, does that mean you should? Personally, I don’t think so. If we act exactly the same way when we are traveling as we do at home, is it worth even leaving the house? What do you think? Is it important to conform to the expectations of places we visit? Or does it not matter since we are just visitors? I think it's important to make as much effort as possible, but I definitely can understand that there would be limitations.